submissions We welcome all styles of weddings and photo shoots - send us your work to submissions@ theweddingplaybook.com. 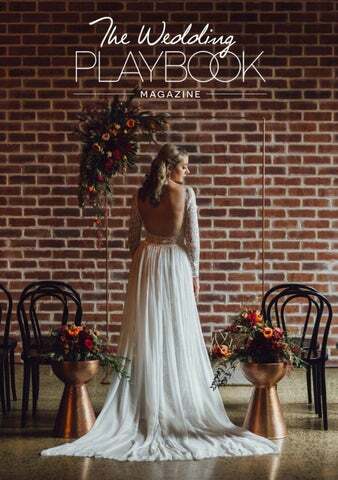 advertise The Playbook Creative is a community of Australian wedding suppliers we love to recommend. Keen to be involved? Drop us a line at connect@ theweddingplaybook.com. Jane and Troyâ&#x20AC;&#x2122;s vibrant cocktail wedding features a stunning mix of bright florals and lush tropical details, all delivered in relaxed bohemian style. Their day features a joyful first look, shell chandeliers, inflatable flamingos and even a tutu-wearing Pup of Honour! It was the perfect party for this fun-loving couple. Planning Together â&#x20AC;&#x153;Wedding planning was the most amazing time! Troy and I did pretty much everything together and I really think it added an extra spark to our relationship. If we ever felt overwhelmed or pressured to do anything, we just stopped and came back to it another day.â&#x20AC;? Set time aside to sneak away and look at the reception - it was great to see that everyone was having as much fun as us! Creating beautiful wedding hairstyles across the Gold Coast and Brisbane. Sit back and relax as I bring my salon to you! Georgie and Jarren always wanted their wedding to have a relaxed party vibe, and their stunning celebration delivered with great atmosphere, chic details and timeless style! Set in a clear marquee illuminated by draped festoons, it was an elegant affair awash with white, grey and peach details. It was easy and convenient to have our wedding in the one venue so our guests could stay in one spot for the day and enjoy the tunes, canapĂŠs and drinks. Communicake it designs and produces beautiful, unique and witty cake toppers to help people celebrate special moments! Made out of acrylic or timber, all products are Australian designed and made by Bianca Mediati. Creating wedding invitations and stationery for couples Australia wide. Our online creative studio offers a custom artwork service to capture your unique style, as well as a selection of designs inspired by beautiful florals and natural elements. A boutique collective of musicians and creatives, we enhance your event to produce a celebration to remember. With our personalised service, planning your event entertainment is friendly, professional, and easy. Contact us at info@evententertainers.com.au. Baker Boys Band truly are the exceptional choice for your wedding entertainment. Showcasing some of Australia's best professional young musicians, they guarantee to fill the dance floor and get your party jumping! Based in Perth, we specialise in beautiful English china and vintage tableware hire including gold and silver cutlery, cake stands and crystal barware. Perfect for DIY couples, wedding planners and creatives who enjoy filling a blank canvas with character and love. We specialise in beautifully hand illustrated wedding chalkboards and signage. Directional signs, menus, photography props, backdrops, seating charts and table numbers - all bring a personal, creative touch to your day. A destination wedding venue offering an exclusive private garden for wedding ceremonies and intimate twilight receptions. After getting ready in a luxury guesthouse and exchanging your vows, enjoy countless photo opportunities and a celebration under the stars. A boutique event entertainment agency in Sydney and Melbourne connecting couples with bands and DJs to suit all musical tastes - whether you’re after dance-floor fillers, laid back grooves, an elegant string quartet, a sophisticated Jazz band or an unforgettable DJ! A made-to-measure tailoring house in Sydney and Melbourne, we work with you to craft the perfect wedding suit, including looks from formal to casual. Arrange a personal consultation, and we’ll help you and your groomsmen celebrate in style. We’re in the business of creating beautiful imagery, providing eternal memories for elegantly quirky couples in love. Capturing your real connection, raw emotion and candid moments is an incredible part of our job - we want to share your story. We’re a Sydney cake company specialising in freshly baked and decorated naked cakes, with an extensive list of mouth-watering flavours. We ensure we understand your wedding cake dream with a complimentary consultation. Sammy & Lola can quite literally put your name (or most anything else) up in lights. When you visualise your perfect day, do you see your guests exclaiming â&#x20AC;&#x153;Wow!â&#x20AC;? as they walk into the room? You just might be a Sammy & Lola bride. Mobile makeup artist Ali spends her days travelling the Riverina and ACT, beautifying brides on their magical day. She specialises in flawless and naturally elegant wedding makeup, delivering perfect pouts and vintage mystique! Located in Kiama Downs on the South Coast, this creative team of experienced florists can style any event with beautiful flowers, including sourcing amazing arbors and vintage pieces to help you create your dream wedding! Our ethos is simple. Gorgeous design, beautiful seasonal blooms and textural foliage. We live and breathe wedding and event flowers, and have endless creative ideas. Established 2007. Northern Beaches, Sydney. Hayley and Andrewâ&#x20AC;&#x2122;s natural bohemian wedding features a host of creative and thoughtful ideas. Abundant greenery, luxe metallic details and modern DIY take their styling next level â&#x20AC;&#x201C; including gorgeous bridal party gift boxes and succulent filled prisms for carrying the rings. Bridal Style â&#x20AC;&#x153;I had my wedding dress custom made from a design I loved, tweaking it to suit my own personal style. I wanted my best girls to feel as beautiful and confident as I would. They found their own white lace dresses - having them all different looked amazing.â&#x20AC;? I'm all for making things personalised - I don't think there's a better way to showcase who you are! Do It Yourself â&#x20AC;&#x153;DIY projects helped bring 'us' out in our wedding, and we incorporated nature to compliment the hinterlandstyle venue. A beautiful timber arbour was decorated with a large centrepiece and hanging macramĂŠ for a natural bohemian feel. I painted our favourite love quotes on photo frames for table decorations. I also sourced brass and copper vases, pairing them with pheasant feathers, vines, soft white flowers, pineapples and gold cutlery.â&#x20AC;? We have been designing and printing bespoke wedding stationery for nearly 10 years, using beautiful antique letterpress and foiling machines on only the best quality papers. Enquire online, by email or phone, or arrange an appointment at our studio south of Adelaide. Barossa Style Bar Hair & Make Up Artistry pride themselves on having the utmost professionalism, service and attention to detail. Accomplished hair and make up artists servicing Barossa, Clare Valley, Adelaide, and beyond. We travel for your convenience. Based on the Sunshine Coast, we provide catering, styling and planning for weddings along the East Coast of Australia. Whatever your style, we ensure your special event is uniquely designed, managed and focused on capturing your personality and vision! An artisan baker who uses organic, local and seasonal produce, Gillian develops all of her recipes so couples can have a wedding cake created especially for them. With flavours like strawberry and elderflower, fig and violet, her cakes are often finished with edible flowers. Specialising in lighting and styling, we provide expert consulting in design décor, ceiling rigging and installation, audio visual and sound equipment, marquee lighting, a large range of unique styling pieces and endless ideas! Ivy & Bleu are specialists in creating beautiful events, offering wedding planning and event styling, floral design and DIY hire options across South East Queensland. With our bespoke services you’re in control, we just help turn your ideas into reality! We’re a team of creatives that help you plan your wedding day in style, whether it’s full wedding planning you need help with, our expertise in styling and design or pulling everything together on the day! Servicing South East Queensland and Northern New South Wales. We love creating beautiful weddings that represent your love story - our styling, hire and day coordination services are available from Byron Bay to the Sunshine Coast. Including luxe to boho, you’ll find whatever furniture, décor and lighting options you need. A professional makeup artist and hairstylist specialising in natural, romantic hair and makeup for brides in Brisbane and surrounds. Lainie is known for her attention to detail and her warmth and passion when focusing on you on your wonderful day. Shannon is a professional makeup artist specialising in flawless complexions from the Sunshine Coast to Byron Bay. Creating a makeup look to suit your style, her immaculate finish withstands all the elements - tears, laughter, rain and champagne! Erin Clare is an Australian wedding dress designer stocking boutiques in Sydney, Melbourne, Brisbane, Noosa and Los Angeles. Locally crafted to the highest standards, she creates fresh original designs for brides searching for unique and graceful gowns. Award-winning, mobile wedding hairstylist Melissa creates beautiful hairstyles for all occasions across the Gold Coast and Brisbane. Specialising in both up and down styles, her passion is creating amazing looks which capture each personâ&#x20AC;&#x2122;s unique style and beauty. Chantelle is a natural light junkie based in Rockhampton, specialising in hanging out with couples in love and taking their photos. With a love for movement and real unposed moments, your wedding images will have an elegant rawness to last a lifetime. This Gold Coast based photographer captures beautiful, candid moments naturally and effortlessly. Known for her calm and unobtrusive style, Lee is moved and inspired by love, and offers engagement shoots to help you feel comfortable in front of the camera. Brisbane-based photographer Dee is an experienced visual storyteller. Her images are filled with detail and real emotion, captured in a way that could fill pages in a magazine. Available to couples far and wide, for weddings large or small! Margaret Riverâ&#x20AC;&#x2122;s Secret Garden is a prestigious wedding venue in the South West of Western Australia, offering an exclusive, private garden for your Wedding Ceremony or Intimate Twilight Reception. We welcome your enquiry and invite you to discuss your special requirements, to create the perfect Wedding here at Margaret Riverâ&#x20AC;&#x2122;s Secret Garden. April and Josh's rustic wedding was the perfect excuse for a weekend getaway with their family and bridal party! They planned a romantic garden ceremony and fairtyale barn reception complete with flowers, candles and an open air dance floor, adding sweet handmade touches like DIY potted succulent favours. Secret Garden â&#x20AC;&#x153;We had a garden wedding in an amazing venue so we didnâ&#x20AC;&#x2122;t want to over-style it. Our arbour was made out of wooden branches adorned with flowers, with mismatched white chairs and a mirror sign welcoming guests. We had a drinks table set up in the front garden for everyone to mingle before the ceremony.â&#x20AC;? Angela is the belle of the ball at her magical wedding to Shayne! As an interior designer, she had no trouble envisioning how their day would look and feel, and worked with their stylist to bring it all to life amidst vintage carnival details - think chandeliers, cascading greenery and flower bombs creating a shimmering spectacle overhead as they exchanged vows. After a surprise proposal in New York to celebrate their five year anniversary, Troy and Alison wanted the wedding planning to be as fuss free as possible. Their flower draped ceremony arbour is a styling highlight in modern green and white, with soft grey bridesmaid dresses and boys in blue simply divine! Take Two “I had a bad experience the first time I tried on wedding dresses, but my sister convinced me to try somewhere else and that's where I found the dress. Everyone is absolutely right when they say, ‘When you know, you know!’” Alison paired her elegant gown with a loosely structured bouquet featuring creamy white blooms and vibrant greenery bound with an ivory ribbon. Stick to your budget and enjoy the process! Don't let anything stress you out - no one will notice if something hasn't gone to plan.